From the entry gate of the resort, we drive through a “jungle” of tropical trees and dense thickets of mangroves, a landscape suggestive of the Riviera Maya as it used to be, a tropical green refuge bordering the blue Caribbean. At the Ambassador lobby, one of the resort’s three areas or “ambiances,” the staff offers us refreshing cold towels and glasses of iced mango-kiwi tea. It’s hard to take our eyes off the view: a series of infinity pools that seem, from our vantage point, to merge into the sea. The lobby’s tall, white walls, topped by a 100-foot high palapa (thatched roof) ceiling, frame the scene. 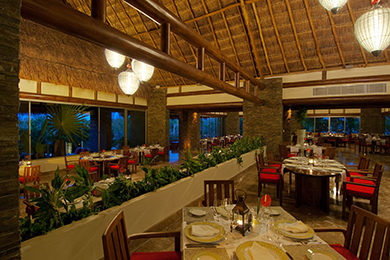 The Grand Velas Riviera Maya, is so impressive, that it’s hard to believe the resort functions as an all-inclusive. But it does. 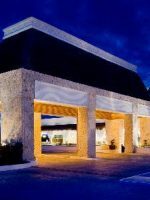 The Grand Velas Riviera Maya, opened November 2008, and offers eight specialty restaurants — each included in your price — plus accommodations hovering at around 1,200 square feet and one butler/concierge for every 12 guestrooms. 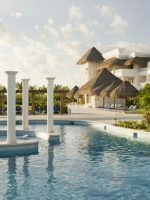 The food and facilities at the Grand Velas Riviera Maya conjure up comparisons to the area’s five-diamond properties such as the Ritz-Carlton Cancun and the JW Marriott Cancun. The Grand Velas Riviera Maya spreads out on 205 acres and offers 491 all-suite accommodations in three different sections. While the Grand Class accepts only adults, both the Master Class, Zen Grand and Ambassador Class, welcome families. The three lodging areas serve to mitigate crowds and to keep the convention business from overwhelming families traveling on their own. 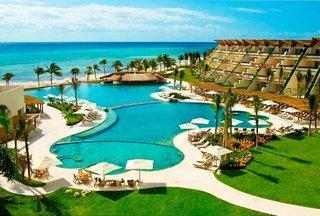 Grand Velas’ all-inclusive concept also banishes a boisterous activities staff. 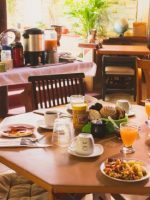 Instead of dragging guests off their lounge chairs to join in a chicken dance or a volleyball game, the attendants gently inquire if you want a drink or any food. A kids’ club entertains children and a teen club keeps those 13 to 18 year olds happy, even after sundown. Regardless, the resort’s number goal is for everyone to have a memorable experience. 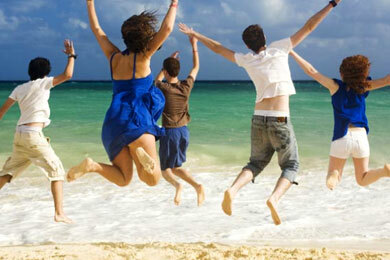 The Resort offers three areas full of comfort, whether you desire a tranquil stay among adults or a fun family getaway. The adult-only area of the resort features 90 ocean-view suites with private plunge pools. This section accepts teens from 12 to 16 years old sharing suite with their parents. This section offer 195 suites, conveniently arranged around the main infinity pool, near the Kid's Club and the gym. This family-friendly section offers 206 suites surrounded by lush vegetation and all guests can enjoy of the Zen Grand Pool with a mini-bar for your convenience. Pick the Ambassador "ambiance." Since the tiered, Mayan-style buildings form a horseshoe, the rooms furthest from the beach offer full-ocean views while the ones on the sides feature partial ocean views. The rooms in this section, called "suites" by the resort for their size, are actually one grand space--1,270 square feet. Tastefully decorated with dark wood headboards, granite desks and flat-screen TV's, the guest rooms feature balconies or patios and marble bathrooms with Jacuzzi tubs plus separate showers. Guestrooms can accommodate up to two adults and two children ages 2 to 16 years, plus one baby under 2 years. Couches in the rooms are not sofa beds and cribs are available at no extra charge. The butler/concierge makes sure your mini-bar has what you want as well as books dinner reservations and tours and serves as the "go-to" person for any questions or concerns. We just got back from the most amazing week at the Grand Velas. The service from the moment you arrive is outstanding! We loved the food so much! The buffet breakfast at Chaka was great each morning. There is something for everyone and it is delicious. Alberto one of the servers at Chaka remembered what we liked to drink each morning! We loved Frida (my favorite), Piaf, Lucca and Sen Lin. The kids found food they loved at each restaurant. They are very accommodating to even picky eaters. You need to be adventurous eater at Cocina de Autor. My husband really enjoyed that experience. We all loved the pool at the Ambassador. Each day they would set up activities for the kids which was great! Jorge Gonzalez one of the pool concierges was the BEST! We were a group of 19 and he was so attentive to all of us! The drinks and food set up by pool and beach were awesome. Our kids went to the kids club a few nights so the adults could go out! They brought them to eat and then to the nightly show. My only suggestion would be keep the kid clubs to probably age 6. It really is for younger children. Our 7 to 12 year olds loved the teen club! They did not want to leave when we picked them up. The hydrotherapy experience at the spa is a MUST. We all loved it so much! You leave completely relaxed! Everyone was so friendly and helpful everywhere you go! Would go back in a minute! Grand Velas Riviera Maya was a fantastic resort. The Staff was beyond helpful, the food was fantastic, the facilities were top notch and the pool was second to none. After this visit, we are booking again for next year. 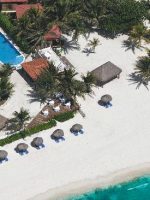 Unlike some Riviera Maya resorts, the beach at Grand Velas is ample: 1,640 feet of ocean frontage, divided into an adult section that borders the Grand Class wing and the larger section abutting the family-friendly Ambassador Class wing. 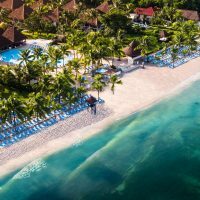 Along with chaises, bed-sized loungers swagged with white curtains beckon on the sand and the staff is happy to plant a beach umbrella at your side for shade. Although the sea here isn't flat, a strategically placed artificial breakwater often reduces the waves headed to shore to manageable ripples. Young kids, however, may need some coaxing into the water as the waves crashing on the far side of the breakwater -- delightful to hear for adults -- may sound frightening. Once in the water, the gentle slope makes the relatively shallow area stretch for about 10 to 15 feet, depending on the tide. Non-oceangoers can play in the pools, three nearly connected expanses of water. Little ones splash in the shallow area with its zero-entry and maximum depth of 18 inches while older kids and adults swim in the other two sections. No fountains, geysers or sprays entice kids, but the pools do come with sweeping beach and sea views. The Kids Program operates daily for ages 5 to 12 from 9 a.m. to 10 p.m., with facilities in the Ambassador section. Children craft masks, create balloon animals, play Xbox and Nintendo Wii games, learn Spanish words and listen to stories. Since most activities take place inside the children's activity room, the program typically works better for younger kids. Older children may enjoy of the teen facilities, which is designed with everything a teen could want. The Teen Center is for teens 13 to 18 years, and features range from billiard and arcade games, to video game systems like Xbox, Kinect and PS3, special seats with built in speakers for enhanced game play, and individual cubicles with a 40-inch LED TV. 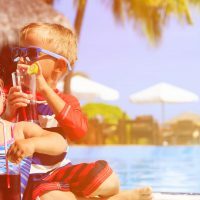 A drawback for some guests is that the list of activities--complimentary or for extra fees-- at the Grand Velas isn't as extensive as at some other all-inclusives. While you won't find skateboarding, trapeze flying or even tennis, you can sign up for free snorkeling, sailing and kayaking trips and join in bocce and volleyball games. Or take a free ecological bicycle tour of the property, learn about the eco-system, and adopt a mangrove or zapote tree for a $10 donation to an ecological foundation. 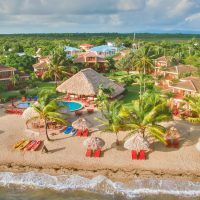 The resort, which has already re-forested the property with more than 19,000 adult trees, will plant a tree in your name, provide a certificate and give you the coordinates of "your" tree so you can watch it grow on Google Earth. What can you do in the evenings with your kids? Take to the stage of the Karaoke bar, open just for families from 6 to 9 p.m. Then settle in to your spacious room for sweet dreams. 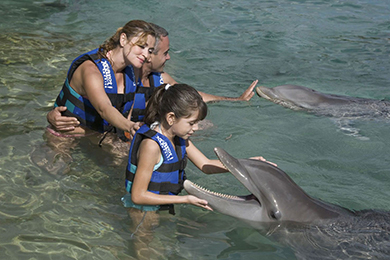 With the help of your concierge/butler, book off-property excursions to Tulum, an impressive Maya ruin about one hour away, as well as outings to nearby Playa del Carmen for shopping, and to Xcaret, a park combining animal viewing, swimming with dolphins and evening performances of traditional Mexican dances. 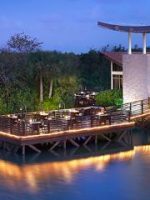 Instead of cavernous, camp-like dining areas, the resort features several moderately sized specialty restaurants, that are all family-friendly. Open 7 a.m. to 11 p.m., Azul serves breakfast, lunch and dinner buffets as well as items from a menu. Choose either or select items from both. Options include Mahi Mahi, duck kebabs, lobster tacos and, for dessert, mango sorbet with a touch of chili. Chaka is a family-friendly dining option open for breakfast and lunch seasonally. It serves International flavors. In a setting of fountains and cream and rust marble, Frida serves upmarket Mexican cuisine. Be sure to try the lobster and crab chilpachole soup, a tasty treat. Entrees include veal shank, tamarind, crispy duck and enchiladas stuffed with lobster. For those too young to appreciate such pleasures, Frida's kids' menu offers grilled chicken breast, fettuccine and steak with French fries. Open from 6 to 11 p.m.
Sen Lin, serves Asian fusion cuisine from 6 to 11 p.m. daily and is family-friendly. Lucca, an Italian restaurant, is family-friendly and open daily from 6 to 11 p.m.
Piaf serves French fare and only allows children ages 12 and older to dine there. Open daily from 6 to 11 p.m. Bistro is another specialty French restaurant, that only allows children age 12 or older to dine. Open for breakfast, lunch and dinner, from 7 a.m. to 11 p.m. daily. Cocina de Autor, which serves a Spanish-inspired, eclectic mix of tastes based on molecular cuisine, is also only open to children ages 12 and older. Open from 6 to 11 p.m. daily. 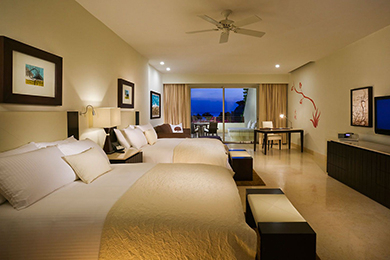 The Grand Velas also features 24-hour room service at no extra charge. This comes in handy when kids (and you) come back from a day in the sun hungry, but too tired to walk to the nearest eatery. Babysitting is available at $18 U.S. per hour for the first child, and $23 U.S. dollars for two children and $28 U.S. dollars per hour for three children. High season runs from January to May and also includes two weeks at Christmas. Shoulder season includes May, November and the first two weeks in December. Low season includes June through October. Fly into the Cancun International Airport, which is served by American, Continental, Delta, Northwest, United and U.S. Airways and other carriers. Book your transportation ahead of time to reach the resort, located 40 miles from the airport. The resort offers transportation to and from the airport. 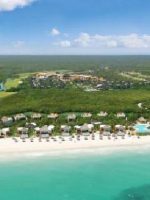 The resort will pay for a one-time, one-way cab ride to Playa del Carmen, the shopping and restaurant hub that's about a five-minute drive from the resort. You'll want to experience the 89,305-square-foot spa. A treatment here begins with a water journey that includes soaking tubs and therapeutic showers. Complimentary with a spa treatment, the water journey costs $80 by itself.